1. What is meat quality? Chapter 5: What’s New in Meat Oxidation? 3. An ecolabel for edible insects? 6. An innate preference for meat? 7. Gender divide; do men and women have different attitudes to meat? 9. Comminuted chicken nuggets, beef burgers and sausages—is this the inevitable future of meat consumption? 13. Sustainably grass fed meat—arguably the most “natural” food in the modern diet? 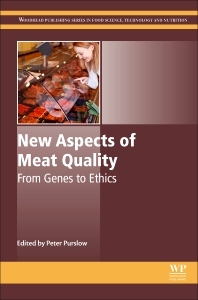 New Aspects of Meat Quality: From Genes to Ethics provides a reference source that covers what constitutes meat quality in the minds of consumers, marketers, and producers in the 21st century, using the same scientific authority as texts on traditional meat quality values. Traditional measures in meat quality, such as texture, waterholding, color, flavor/aroma, safety/microbiology, and processing characteristics are still important, however, additional quality attributes now have huge importance in the purchasing intentions of consumers in many countries. These include, amongst others, animal welfare, the impacts of meat on human health, quality assurance schemes, organic/free range, ethical meat production, and the desirability of genetically modified organisms. The book is divided into three main sections, with the first section covering the developments in our understanding of how muscle structure affects the eating qualities of cooked meat. The second section highlights recently developed techniques for measuring, predicting, and producing meat quality, and how these new techniques help us minimize variability in eating quality and/or maximize value. The final section identifies the current qualities of consumer and public perceptions, and what is sustainable, ethical, desirable, and healthy in meat production and consumption. Peter Purslow is a Professor in Food Technology at University of Central Province of Buenos Aires, Argentina. He has previously worked in senior roles at the University of Guelph in Canada, including as the Head of the Food Science Department. He is one of the Associate Editors of Meat Science – the leading journal in the area, published by Elsevier.